Last week, ExSE took a hard look at the environmental challenges facing the Mekong Delta region and found that the prospects are not good. Due to unenviable geography and global warming, rising sea levels, higher average temperatures and irregular precipitation patterns will all converge in the next 50 years to change the face of the Mekong Delta (MKD). That’s to say nothing of salinity intrusion, flooding and tropical storms. However, the MKD’s problems are not only environmental in nature; the region’s economy also faces a host of challenges, many of them tied to the Delta’s environmental changes. Issues in the Mekong Delta are of course significant for its residents, but they also carry great importance for those outside the region because of the MKD’s role in national and regional food security. The statistics on the Delta are incredible. In an area taking up just 36,000 square kilometers (12 % of Vietnam’s total area), the Delta’s 22 million inhabitants plant 2.6 rice crops per year totaling 25 million tons of rice. The MKD’s rice production accounts for over half of Vietnam’s total and the seven million tons rice that the Delta exports has helped Vietnam become the world’s second largest rice exporter after Thailand. In addition, the Delta accounts for 70% of Vietnam’s fruit production and three-quarters of its fish catch. The Delta’s massive agricultural output is no accident. The region is perfectly situated to receive large amounts of water and sediment from the three main stems of the Mekong Delta and the many thousands of canals that intersect them and a tropical temperature allows for farming year-round. What’s more, concerted efforts in the past 30 years to improve the region’s water infrastructure have doubled arable land in the MKD. Combined with advances in genetically modified rice strains, yields in the Delta have increased by 30% and total production has doubled, all within the past 20 years. Incomes have also increased. According to the General Statistics Office of Vietnam (GSO), the average income of Delta residents has gone from 50 cents USD/day in 1999 to $2/day in 2010 and the region reached it Millennium Development Goals in 2006. However, despite impressive improvements in agricultural output and per capita income, the Delta has lost ground to other regions of Vietnam and now lags behind in important measurements of human and economic development. Source: Dr. Ho Long Phi, processed from data of General Statistics Office of Vietnam. One of these bottlenecks is a lack of infrastructure. The proportion of waterways, intra-provincial roads and inter-provincial roads per thousand people are all behind the national average. 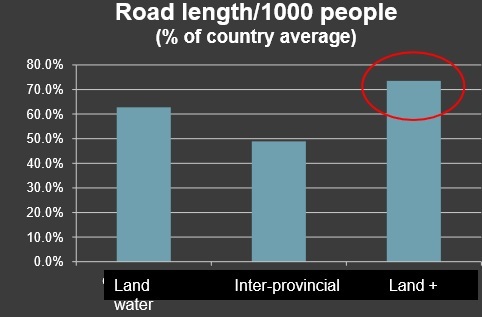 Of these three measures, the proportion of inter-provincial roads stands out. For one, there are only 0.34km of them per 1000 people in the Delta, standing at only half of the national average. This is especially important because of the nature of the Delta’s economy. The MKD, because its economy is so heavily concentrated in agriculture, lacks many necessary products and thus has a long history of importing and exporting nearly everything. While this may be good for enterprising middlemen, it is not good for the region’s economic development. With so few avenues for importing and exporting goods, the logisitical cost rises and because the MKD lacks so many raw materials, industrial development becomes disadvantageous. In fact, unless an investor is interested in agricultural processing, building a factory closer to Ho Chi Minh City is probably a better business plan in many cases. A second bottleneck, and another reason a potential investor might not consider the Delta, is a lack of skilled labor. Like the region’s road density, the MKD’s percentage of trained labor lags behind the national average; according to data collected by GSO (General Statistics Office of Vietnam) the Delta’s percentage of trained labor stood at just over half of the national average. 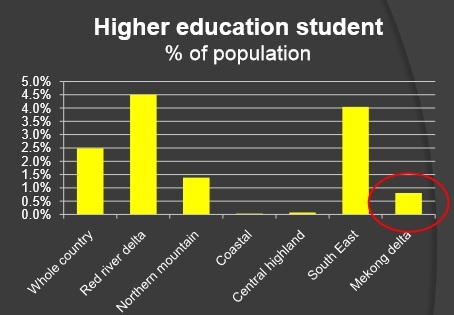 In addition, the proportion of Delta residents with some sort of higher education stood at less than 1%, or in other words, just a fifth of the national average. With a workforce that is so poorly trained and educated, the Delta becomes an even less attractive region for investment, especially when compared to the populations near the Red River Delta (Hanoi and its environs) or Ho Chi Minh City. What’s more, those Delta residents that have some technical training and/or higher education do not stay in the Delta for long. As the region’s economy falls farther behind the rest of Vietnam, more and more Delta residents are moving to urban centers to look for work. One of the main destinations for these people is Ho Chi Minh City, where over half of the city’s migrant workers come from the Mekong Delta. What trained labor the MKD might have ends up leaving the region for greener pastures, thus widening the gap between the Delta and places like Ho Chi Minh City. One reason that the MKD has such a low percentages of trained labor and educated inhabitants is that in the past there was no need for supplementary education of any form. In an environment where the annual rice yields are stable and prices are good enough, investing time and money for a new career is an unnecessary risk and one that Delta residents have not taken. Paddy rice cultivation requires little technical skill yet provides a modest, usually stable income. However, the income provided from rice is rarely enough to invest in the expansion of other industries and in the Delta’s case, the lack of infrastructure makes such an investment an even more expensive proposition.Unfortunately for the farmers of the Mekong Delta, rice cultivation is becoming a less and less stable enterprise. For one, the price of rice has dropped in the past decade. As more and more rice is produced worldwide, the seven tons of rice the Delta exports annually decreases in value and farmers lose out. However, shifts in the world rice market are nothing compared to problems farmers face due to global warming. As detailed here, rising temperatures, sea level rise, an erratic precipitation and flood schedule and more frequent tropical storms all threaten to radically alter the Mekong Delta in the next century. The region already has enough impediments to development with its lack of infrastructure and trained labor; its environmental issues only add to the severity of the situation. The Delta, now more than ever, is in acute need of solutions. However, who’s coming up with these solutions, if there are any to begin with, is another question unto itself and one that needs to be answered before any future for the Mekong Delta can be imagined. The announcement was made on Thursday during a meeting of the Mekong River Commission in Bangkok. Representatives from Thailand, Laos, Vietnam and Cambodia — all members of the commission — participated in the meeting. The agreement provided no provision for delaying the project before an adequate environmental study could be completed. “Prior consultation does not stipulate any condition on continuing or not continuing” construction of the dam, Hans Guttman, the commission’s chief executive officer, told reporters. Guttman said the prior consultation should begin in July, with the process expected to take about six months. He said Laos did not offer to delay construction on the dam, nor did neighboring countries ask for a delay during the consultation period. The Laos delegation did not release a statement or meet with reporters following the daylong meeting. Laos has begun preliminary construction on infrastructure at the dam site, despite strong opposition from Vietnam and Cambodia, who requested a 10-year moratorium on dam construction on the Mekong mainstream until further studies could be completed. Earlier, Vietnam, Cambodia and Thailand stated that the dam must undergo prior consultation, as required under the 1995 Mekong agreement, to which Laos is a signatory. The Don Sahong dam is being constructed in the mainstream part of the Mekong River in the southern province of Champasak, nearly two kilometers upstream from the Laos-Cambodia border. Opponents of the project fear the dam will block the migration of fish and cause a steep drop in the flow of water to those living downstream. Nonn Panitvong, an adviser to the Green World Foundation, said plans to build several dams along the Mekong, would transform the river, the world’s second-most biodiverse river after the Amazon, “into a giant freshwater pond”. “That would be the end of the Mekong River,” he said. Ame Trandem, Southeast Asia program director for International Rivers, called on neighboring countries to pressure Laos to delay construction until prior consultation is completed. “Neighboring countries must articulate to Laos their own intentions in what this process means, otherwise, the prior consultation process is likely to have missed the point entirely,” Trandem told ucanews.com. Trandem said she hopes Laos proceeds with good faith rather than issue an “empty political statement”. “All construction should stop on the Don Sahong dam until a transboundary impact assessment is carried out and meaningful consultation takes place,” she said. This article by Stephen Steele was originally posted here on June 27, 2014 on the UCA News website. 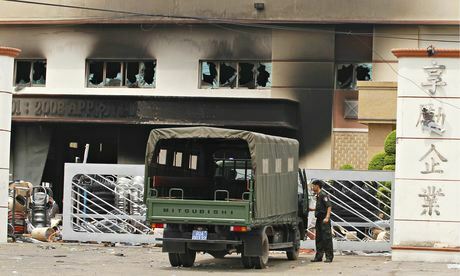 Editor’s note: The following article was written by Patrick Scally and originally published on the website Go Kunming. It is reprinted here in its entirety. The media in Yunnan, and around the country, is often overly fond of splashy headlines containing enormous investment figures. The articles that follow are generally paeans to a modernizing society and the wonders of Chinese-style capitalism. Failure is rarely chronicled. That is far from the case in Hekou (河口), which is currently receiving plenty of negative journalistic buzz due to a development project provincial officials have deemed an embarrassing and costly “boondoggle”. At issue is a 270 million yuan (US$43 million) construction project on the banks of the Honghe River (红河). The China-Asean International Tourist Cultural Scenic Corridor had been under construction since 2011, when the government approved development on the site, a kilometer-long stretch of uninhabited land. Designed to be a showpiece of the city’s economic growth, the enterprise has become an object of public scorn and a symbol of miserable urban planning. The entire riverside development is now slated to be torn down at a cost surpassing that of its construction. 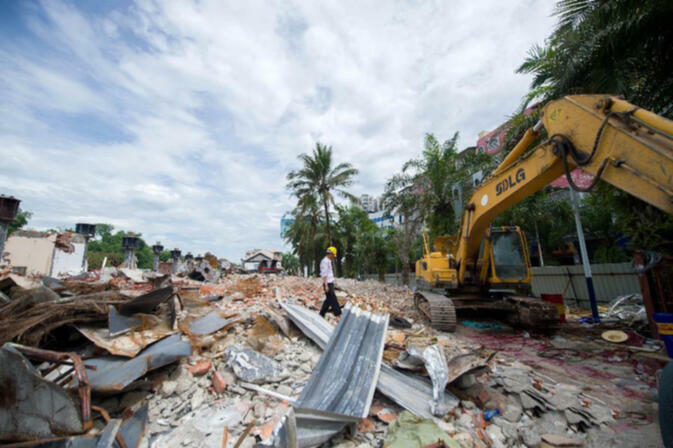 Conservatively estimated at 300 million yuan (US$48 million), demolition costs include the projected expenses of paying back investors and cleaning up the site. Although the corridor was nearly finished, its 150 mixed-use shopping and business venues are currently being razed and will eventually be converted into public green space. The decision to halt and ultimately destroy the venture is a “policy adjustment” by the local government, according to a South China Morning Post (SCMP) report. Concerns over poor planning and improper waste disposal were raised by local residents as the project neared completion. Complaints increased and the endeavor, which was hoped to complement and augment natural scenery, became a blight that authorities describe as a “negative influence” on the riverside. Investors, shop owners and even low-level government planners were apparently surprised when the announcement came to dismantle the corridor. 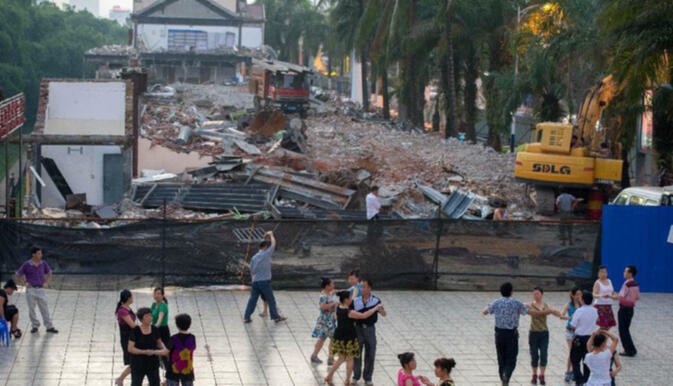 “It never occurred to us that a new order [for demolition] would come so soon,” an unnamed city planner told the SCMP. Locals have taken things more in stride, using a still-standing plaza for ballroom dancing in the evenings. Hekou sits on the shore of the Honghe River and is joined with the Vietnamese city of Lào Cai by bridge. For most of the past decade, provincial developers have been throwing money at the area in hopes of turning the city into a major trade depot connecting China, Vietnam and other Southeast Asian countries. In 2008, a highway connecting Hekou County to major cities in neighboring countries was completed and work is well underway on a railway project linking Kunming to Hekou and, eventually, Hanoi. 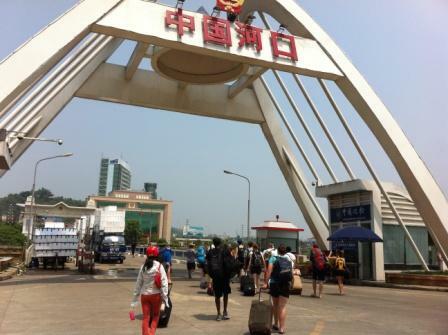 For now, however, it appears the 80,000 residents of Hekou will have to wait to see a venue that properly expresses their town’s importance as a regional trade hub. Kunming’s Nanping Jie Square, the site of Sunday’s non-protest. The ringtone on my wife’s cell phone abruptly called us awake at 8:30am on Saturday. The caller ID displayed the name of one of my closest friends and colleagues in Kunming, yet I wondered why he was calling my wife. “Comrade, good morning,” rang out his thick Sichuanese accent. This was a standard greeting among my circle of friends, but calling someone comrade in China has long gone out of fashion. So it turns out he spent the previous day at his workplace, a local university, holding meetings with top administration and security brass discussing how to prevent the university’s students from attending a protest scheduled for Sunday, the next day. He told me that a group of Vietnam war veterans from China’s 1979 punitive invasion of Vietnam received approval from the local civil affairs bureau and the local public security bureau to march on the Vietnamese consulate in downtown Kunming. The scheduled march was in reaction to the growing movement of anti-Chinese protests in Vietnam that left more than 20 Chinese, Taiwanese, and Vietnamese dead in the previous week. The starting point was the city’s main pedestrian square at Nanping Street; the march would commence at 9am and finish at 2pm at the consulate. His call was a warning for me to lay low – for all foreigners to lay low – because foreigners, especially Caucasian foreigners could serve as a potential target for angry, nationalistic protesters. He was also calling to warn me to stay far away from the protest. He knew I had a penchant for observing and writing about protests in Kunming, and my actions in the past had landed me and subsequently him only by guilt of association in a little trouble with local security officials. To help place the gravity of the situation squarely on my shoulders, he told me of how he spent the previous evening having meetings with the students under his supervision, pleading them not to attend the protest – even though it was a legal protest – for fear that it may turn violent or take a turn toward other issues that were suppressed and mulling around in the hearts and on the minds of disgruntled people in Kunming. In fact, his work group in cooperation with a successful commercial real estate form had arranged a 5 kilometer eco-walk scheduled for Sunday morning, but due to the protest he decided to cancel the event. His university and the firm apparently poured a good deal of money into the event so he was quite put out by the cancellation. “Right now, we will do what it takes to ensure stability at any cost.” I had heard those words too many times in the last 18 months living in Kunming. 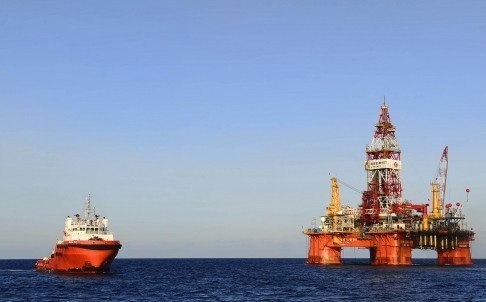 This season of South China Sea’s flare-ups and shenanigans is heating up once again. To provide a quick rundown of the last 10 days: China parks it’s billion dollar oil rig 150 miles off the coast of Vietnam near Da Nang; rams a few curious Vietnamese ships, super soaks other onlookers with high pressure water hoses; foreign ministries respond with sabers rattling; protests broil in Vietnam; Chinese, Korean, and Taiwanese factories burn; people die unnecessarily due to this tricky, inane, orderless, yet extremely critical game of cartography, resource grabbing, and interpretation of the current world order. 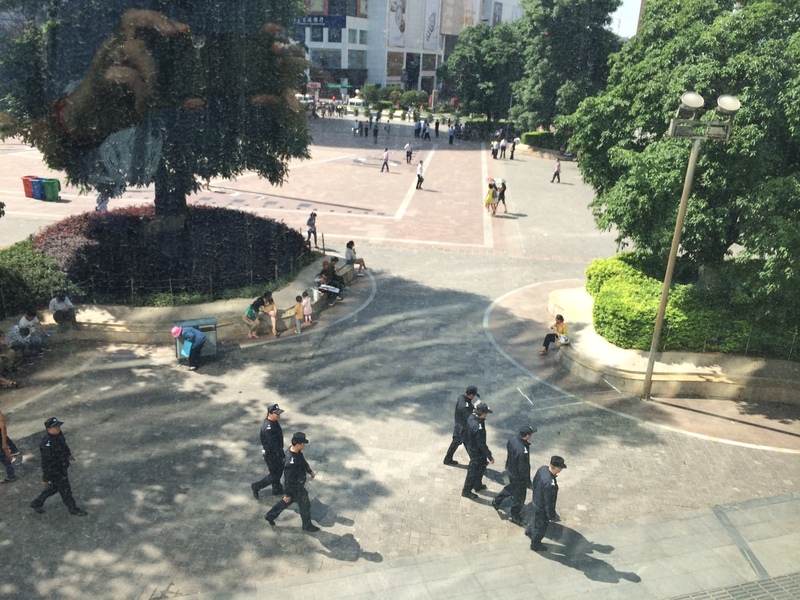 And to round out the week, the first organized civil response in China comes from….Kunming? In some ways Kunming makes sense. The pathway of China’s 1979 spring invasion of Vietnam cut through southeastern Yunnan province into Vietnam’s Lao Cai province. The three month war was a tough decision for the newly installed Deng Xiaoping. He sought to punish Vietnam for its humanitarian invasion of Cambodia to take out the Khmer Rouge and install a new caretaker government, in some ways Deng thought this would help make good on his warming commitment to US-China relations. Many of the troops sent to Vietnam were stationed in Yunnan, Kunming specifically. Many did not return. In total approximately 70,000 soldiers and civilians died in the three month conflict. But then again there is little about Vietnam’s South China Seas claims that make much sense either. From my experience interacting with locals, very few Kunmingers, and Chinese people in general, under the age of 50 know the story and context of the 1979 war. I was not surprised to learn that a group of organized veterans still operated in Kunming given that veteran groups from WWII were still active in Yunnan and much is done in this city to preserve WWII related heritage. But how many were there and how many would show up for the march on Sunday? An organized effort that received government approval and raised the alarms of state related institutions like my friend’s university would likely bring out at least one hundred people. Would they be able to rally more than 1000 Kunmingers under the intense midday sun similar to the anti-PX protests (not government sanctioned) of nearly exactly one year ago? Would the protesters flip and set cars alight? Wait, Vietnam doesn’t produce cars. Would they target people who appeared to be Vietnamese? Wait, I won’t finish that sentence. On Saturday evening, a crowd of Kunming’s expats gathered for the soft opening of a New York style pizzeria. The chatter was (sort of) abuzz with talk of the next day’s scheduled march and protest. Over the previous two days word of the march had spread, for better or worse, among the community via the popular Chinese social media app WeChat, and now the gathering enabled the conversation to go from digital form to the soon-to-be-obsolete vocal communication style characterized by eye contact and hand gestures. Those who watch the Sino-Vietnamese relationship closely know that the situation is not getting any better despite the rosy accolades of year-on-year bilateral trade increases, strengthened cooperation on the (lately not-so-successful) repatriation of illegal Uighur immigrants from Vietnam back to China, and a new high-speed rail and road network connecting Vietnam to China. Watching the relationship from Yunnan province only amplifies the growing crevasses. Looking locally and outside of the South China Sea conflict, foreign direct investment between Yunnan and Vietnam is on the decline and according to the Vietnam Ministry of Industry and Trade office in Kunming, several key Yunnanese invested projects in Vietnam have been put on hold. Last year Vietnam Airlines suddenly cancelled its daily flight from Kunming to Hanoi. Two years ago you could readily buy Vietnamese Banh My sandwiches from food carts in downtown Kunming, and now none are to be found. 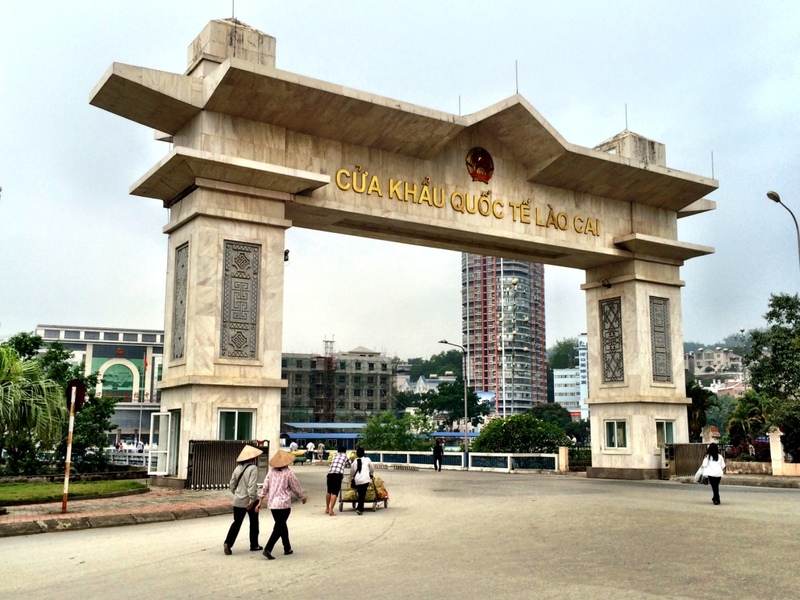 Enrollments of Vietnamese nationals into Kunming’s university level Chinese language programs are on the decline and are eclipsed by students from Thailand and Laos. This spring, neighboring Guangxi province closed the border to watermelon imports from Vietnam which gouged prices at home in Vietnam and angered many farmers. The list goes on, but I must mention that the yearly China-Vietnam Friendship Tennis Tournament which traditionally ushers in Kunming’s Southeast Asia Expo has been suspended for the last two years. Both sides suspect each other of stacking the line-up with semi-pro players and accuse each other of foul play. Waking on Sunday morning, the day of the march, I pondered the deterioration of this relationship. It was clear that more were losing than winning, but how many of Kunming’s everyday citizens are directly affected by the recent cooling and would the protesting veterans be able to gather enough onlookers into their fold in order to make an impactful statement? I also pondered my friend’s advice on whether or not to go observe the march – but only for a few seconds. With my smart phone charged to the max and ready to live-tweet the march as I had done for the past anti-PX protests in Kunming, I mounted my electric motorbike and made way to the protest zone, picking up a concerned friend along the way. He promised to help navigate the security arrangements citing experience recently gained on a week-long trip to Pakistan. I’ve learned in the past 18 months that the signals of a protest in China begin to appear well before arriving on site, and given this sanctioned protest site was staged for the same site as last year’s initial anti-PX protest, I had a well developed strategy to lay low and observe from afar lest I be spotted and photographed by the local security apparatus. As we approached the downtown pedestrian square at 9:15 just after the march was scheduled to begin, we saw very little increased security presence. From 100 meters away it was easy to see the center of the pedestrian square was cordoned off by local police forces to create a space the size of two football pitches. Local police mingled in and out of the zone, and some middle-aged men sat in the shade of some trees on the periphery of the zone. So far no sign of a protest presented itself. No banners, no t-shirts, no slogans, no face masks, just a nearly empty square. 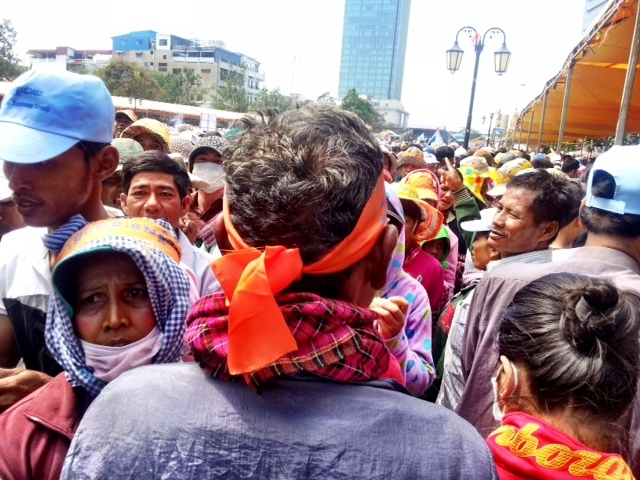 In fact, the most conspicuous aspect was the plain clothes policemen scattered around the square. Always slightly overweight, deep tan, same crew-cut, off-color collared polo, and the signature man bag containing who knows what – the uniform of the Chinese plain clothes policeman is always easy to spot. I also spotted a fellow blogger sitting in the shade inside the protest zone – his blond locks and European pedigree always stand above the crowd at Kunming’s protests in which he often finds himself smack in the middle of. There still wasn’t any action, so my friend and I ducked into an adjacent shopping mall and rushed up to the a 2nd floor Starbucks to find a seat on a sofa beside a window overlooking the square. Needless to say the position of our perch made us feel more like spectators at a sporting event than at China’s first anti-Vietnam protest of the 2014 season. We were free to comment and tweet at will. No security forces were going to bother us there. My VPN was on line and the connection was kicking. And that was just it. Kunming really couldn’t care less. We estimate that fewer than ten veterans showed up. Their t-shirts with Chinese flags gave them away. At about 10:30am, the veterans formed a half-circle in the middle of the square and were escorted around half of the square by uniformed police. Their march lasted less than a minute. A cameraman from the local television station sitting on a shaded bench missed the procession because his boredom turned to a brief chance to catch a nap. At 10:45am, the cameraman picked up his bags and went home. Nothing to see here folks. By 11am the temporary fences were removed, and the pedestrian square exposed to the intensity of the midday sun once again filled with local shoppers making their way through Kunming’s commercial downtown. I was relieved that nothing happened. Perhaps word came down from high for the veterans to cool their guns since the Vietnamese government was making good on its commitment to control the anti-Chinese movements and violence within its own borders. The last thing our little city needs is to have its blue sky reputation tarnished by another incident making the international news and filling the Sinosphere and the South China Seas with flotsam and jetsam. ExSE is excited to announce the addition of a new section to our website! Country profiles are now available for Cambodia, Laos, Myanmar/Burma, Thailand, and Vietnam. These profiles introduce the historical, political, and economic milieu of countries in Southeast Asia and provide you with up to date analysis of current events and developing trends in the region. You will find links to economic and environmental data as well as a discussion of each country’s regional connections (including the China connection!) in a greater context. These country profiles are authored by undergraduate students enrolled in the Regional Development in China and Southeast Asia program at the IES Kunming center. Each semester new students will have the opportunity to update, edit, or add to the existing reports so be sure to check for updates frequently. Country reports can also be accessed via the site’s top menu bar under Profiles. If you have suggestions, contributions, or photos to provide for the country reports, please feel free to contact us at eastbysoutheastmail@gmail.com. Liu Jinxin is the Director of the Pan-Asia Transportation and Logistics Research Center, a Chinese government think-tank that reports to the National Development and Reform Commission. He is currently the chief designer of the BCIM corridor and also acts as a consultant to the Asian Development Bank.